The gospel this weekend is the parable of the multiplication of bread, a sign of God’s generosity to His people; in this miracle God did not only feed the people, he gave them more than they needed; there were leftovers. This parable gives us hope that God will be ready to answer our prayers in our time of need, and he will give us more than we need. But, as we reflect on this miracle of God’s generous love, let us not forget the challenge or the lesson in this miracle. Faced with such an overwhelming number of people in need, the first reaction of the apostles was to act as if the problem would just go away. The apostle asked Jesus to send the people away hungry, but Jesus would not accept a solution that pretended as if there was nothing that could be done. Instead he takes that small gift of loaves and fishes and feeds a multitude of people; a clear sign that solving the problem did not really depend on the size of the resources but on the compassion and generosity of God. The lesson here is simple: when we offer our small gift, or make our little effort, it is God who provides the actual blessings; it is God who does the multiplication. Our world is filled with a lot of needs. Millions of people live in poverty and go to bed hungry every day. We are surrounded by people who are truly alone, without a person in the world who loves them. The gospel invites us to give something, to give our little gift: a few loaves and fish, a kind word, a small donation, a helping hand, a decision to forget ourselves and choose to think of another, a short time spent in prayer lifting those in need before the Lord. And through Divine Multiplication, a miracle occurs. God turns our little gift into a tremendous blessing. We have the power to create a more beautiful world only if we give something; then Jesus can do the rest. Are you ready to give something? Are you ready to do something and allow God to do the multiplication? That’s for you to answer! After my ordination to the priesthood two years ago, my bishop whispered to me, “Now you are a priest, you must start looking for your replacement when you retire, you must talk and promote vocations.” With this in mind I chose my first topic for our bulletin, to talk about vocations, sharing my own vocation story. A vocation is always personal. And I would dare to say, that my priestly vocation is my call to being a Christian and following Jesus. Everyone is called to follow Jesus, but each one has his or her own way. I, Charles, and everyone else must discover his/her way of being a follower of Christ. The most important and that which gives meaning to our lives is to be open to God’s call. I must say yes to Him, to that which He asks of me without conditions. Abraham is the best example of this putting oneself into the hands of God. "Leave your country; I will give you another." But where? When? Along what roads? He did not know, but he trusted and believed in the goodness of God. Let me make this very clear, when God calls us, it's always in order to give us something. It might be the land promised to Abraham or the liberation of the Israelites through Moses. God called Mary in order to give human flesh to the Word, so that through Him, all of humanity might be united with the Father. I also want to suggest that God's invitation and call can be frightening; in fact it must be frightening. Abraham and all the others, including Mary, were disturbed and confused in the face of the God's call. This happens because at first the call seems to be too high, too difficult, and too beautiful for us. The vocation/discernment journey is authentic when Jesus conquers our life, attracts us; then we can say yes, that radical yes which gives value to everything, which can make it worthwhile to be a priest, religious, happily married or even the single life. The most important vocation is that which God has called you to embrace. I was born 35 years ago as youngest in a family of seven children, four brothers and three sisters. As I grew up my parents gave me instructions in religious education and in particular what it means to be a Catholic. I learned to revere the name of Christ, to have devotion to Mary, Mother of our Savior Jesus Christ, and to have a great desire for God. As a young boy I was an active altar server. As a young man in high school I was a member of the Young Catholic Association. When I joined college all this changed. I stopped going to Church with an excuse that I was busy with schoolwork and had a part time job. What this meant was that I had decided I had no time for God, after all, I was in a good college and had a good job. With this there was a vacuum in my life that needed to be filled…and how did I do this? I used to party and spend most of my time and money on alcohol, girls and going to clubs. My life was a life of pleasure and enjoyment with no commitment to anyone but me. At one point I realized something was wrong and that I needed help. I talked with a priest friend and after a couple of weeks of journeying with him, he advised me to seek the Sacrament of Reconciliation after which I felt I had been reborn into a new life of mercy and forgiveness. After this experience I started going for an hour of Adoration every day and this totally changed my life; I began desiring for a different way of life. It was with this habit of prayer and daily Adoration that my life was opened to listening to God. It is through prayer that I discerned God had a different purpose for my life; He wanted me to serve him in this beautiful vocation of ministerial priesthood. Jesus called me in my weakness, he called me as a sinner, and He daily calls each of us, in our weaknesses, to follow him. My advice to the people of St. Gabriel, and in particular the youth, is to take time from your busy life and spend some time with our Lord, especially in Eucharistic Adoration. Ask him what he wants of you. It may take weeks, or months or even years, but if you are sincere and listen, you may find out that he is calling you to this special vocation of serving him as a priest or religious. “The harvest is rich but the laborers are few.” And so, let us ask the Lord of the harvest to send laborers to his harvest. My prayer for you this day is that you might be open to hearing God’s voice and have the courage to follow him wherever he might lead you. Marcellino, you will be GREATLY missed! Sending you all our love and prayers! Fr. Don Kisses a Cow! Fusion exceeded their fundraising goals for St. Vincent dePaul by raising over $1800. We are floored by the generosity of the youth and their families! This money will make a big difference in the lives of the poor in our local community. As their promised reward, youth ministry staff and Fr. Don kissed a cow. Enjoy the video. 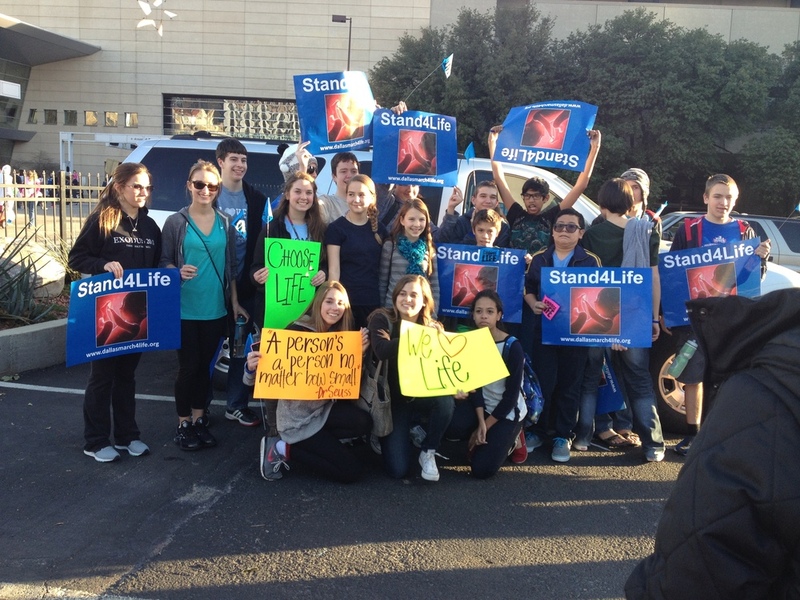 We had a wonderful experience at the Dallas March for Life this past Saturday. Over 10,000 people came to support the right to life and we were very proud to be part of that number. Thanks to everyone who helped make the day possible and please pray for an end to abortion! Click on the pictures to advance the slide show. How many of you have thought to yourselves, "Come on, God loves me whatever I do, he's everywhere, right? Sunday mass is probably important, but its not THAT big of a deal if I miss it." I know I've thought that before. This is an article that my father wrote about Sunday's gospel reading that does a really awesome job of explaining Sunday Mass and why YOU HAVE TO GO OR ELSE YOU GO TO HELL. Eh ehm. So that may have been a little overkill, but anyway. I'll let him take over. "Leprosy is a dreadful thing anywhere, anytime. But in the ancient Near East, it was a particularly heavy burden to bear since it meant complete social isolation. You could, of course, hang out with other lepers. But you were bound to stay far away from the healthy as possible lest they be contaminated with your disease. To be a leper was to be an outcast. And he pledged to worship no other god from that day forward. so that he could erect an altar at home to the God of Israel. Holy Land When Namaan recognized this, he loaded up a cart with soil from the It had come from God. Elisha refused to accept it because the healing had not come from Elisha. He was obliged to express his gratitude by offering a gift. And his response was just matter-of-fact. Namaan was healed instantly and completely. Namaan was a pagan. He probably never heard of the Ten Commandments (Ex 20) which starts off with “I am the Lord your God and you shall not have any strange gods before me.” But Namaan did not need Divine Revelation to tell him what he already knew by way of common sense. He had just received a new lease on life from the God of his enemies. From that moment on, he realized he owed a debt of gratitude to this God that could never fully be repaid, but he was bound to try anyway. None of the other “gods” had been able to give him his life back. They had no power to do so and he owed them nothing. Namaan was a just man and so was determined to pay what he owed as best as he could. How ironic! Israel had experienced extraordinary blessings from God for hundreds of years but failed to express gratitude to God. Instead, they flirted with the idols that Namaan abandoned. Rather than honoring the prophets, they persecuted them. Only one man does –and he just happens to be a Samaritan heretic. Yet none of the Israelites among them takes the time to return to thank Jesus. An encounter with Jesus brings these ten outcasts total healing and restoration to society. We see a similar irony in Luke’s story of the 10 lepers (Luke 17:11-19). Worship of God first and foremost is a strict obligation of justice. We were created out of nothing, through no effort of our own. We were saved by grace; it was not our own doing (Ephesians 2:4). On both counts, we owe God everything. We can never adequately repay him, and so owe him a lifetime of gratitude. That’s why we Catholics speak of our “Sunday obligation.” We are bound, if we are able, to observe the third commandment and keep the Lord’s Day holy by gathering together to give thanks. Eucharist, by the way, means thanksgiving. In the ancient dialogue between priest and people that introduces the Eucharistic (thanksgiving) prayer, we say “it is right to give Him thanks and praise” (“right and just” in the ancient versions). Why must we discharge this obligation at Mass rather than in the comfort of our own homes? Because our sacrifice of thanksgiving is weak and insufficient on its own. There was only One who has ever offered perfect worship to the Father, and His sacrifice is made present again at every Eucharist. Our inadequate “thanks” is absorbed into the perfect sacrifice of praise offered by the Son much like the drop of insipid water the priest puts in the chalice is absorbed into the rich wine that becomes Christ’s blood.We’re called to become a Eucharistic people. We are called to develop a lifestyle of thanksgiving. But thanksgiving can’t be limited to Sunday Eucharist. We are called to develop a lifestyle of thanksgiving. We’re called to become a Eucharistic people." John Gabriel did not think in half-measures. If he was a martyr it is because he was a saint. From 1818 to 1835 he was a missionary in his own country. First, in his formation period, he was a model novice and student. After his priestly ordination (1826), he was charged with the formation of seminarians. Are you a Christian priest? Yes, I am a priest and I preach this religion. Do you wish to renounce your faith? 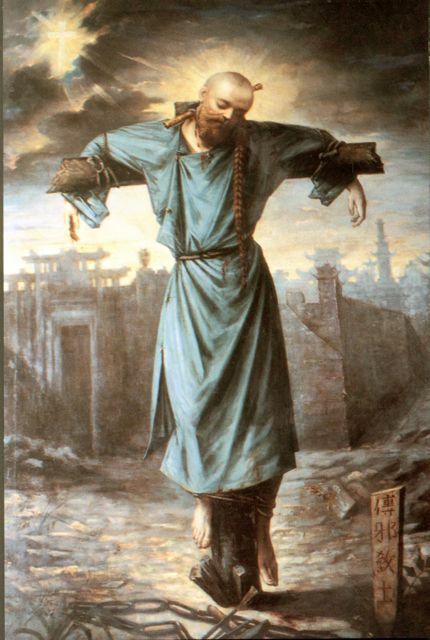 No, I will never renounce the faith of Christ. That is all I could think as we sat together in our work group on the final night of the NOLA mission trip. After a week of painting, digging, sweating, and serving together, after worshiping, dancing, and praising together, and after many hours of sharing our lives together, the mission trip was almost over. Tonight was affirmations night. Ten teens from St Gabriels and St Francis, from all different friend groups and backgrounds sat on pillows in dimly lit office on the floor. We were all exhausted from the weeks work, we all looked just about at our absolute worst. Girls wore no makeup, the guys mohawks were unkempt and wild, but no one cared at all. We weren’t here for attention. The guy that spoke now was a great bear of a teen, nicknamed “Juggernaut,” by the guys. His parents had dragged him to the mission trip kicking and screaming, but now he was arm in arm with Trevor, his new brother in Christ. He wasn’t the only one in this small group who had met Jesus on this trip. We all had. Each teen had a turn to receive affirmations from the other nine. It was E.C.’s turn now, and so she sat up, smiling, receiving the love that each and every teen in the group had to offer her. What is your biggest fear? Spiders? Ghosts? Teletubbies? Well, I have a confession. Up until a few years ago, my biggest fear was priests. Seriously- a heart stopping, unable to breathe must-run-away-fast fear of Priests. If you wanted me out of a room, all you had to do was ask Father to walk in. Priests scared the snot out of me. So, why the irrational fear of priests? Like most of our fears, it comes from a traumatic experience. When I was seventeen, my youth minister and my pastor, both of whom I was close to, were glad to see me leave their Baptist church, a decision I made after a hard senior year where I struggled with Baptist theology. Ultimately, they were glad to see the girl with all the hard questions get away from the other kids. I felt betrayed and rejected. As a result, I decided that I would not let myself get too close to someone in ministry again. I was afraid of being hurt. Throughout the bible, God is constantly telling his people to not be afraid. His mantra seems to be “Do not fear. I’ve got this. Trust me.” Apostle John gives us further insight to fear itself in 1 John 4:18. In this passage, he tells us that God is love; there is no fear in love and perfect love drives out fear. In other words, fear isn’t something that comes from God. In fact, fear can keep us from living the life God desires us to have. The Apostle Peter gives us a great example of how fear affects us. In the gospel of Matthew we find the story of Jesus and Peter walking on water. It goes something like this. All the disciples were in a boat crossing the Sea of Galilee. When Jesus came down the mountain after spending time in prayer, he decided the best way to get to the boat was to walk on the water. So, he does, and the disciples see him coming to the boat but they don’t recognize him. They become afraid. Jesus calls out to them and says, “Don’t worry, it’s just me.” Peter responds, “If it’s really you, then let me walk on the water towards you.” So, Jesus says, “Sure, come on out.” Peter steps out of the boat with his eyes on the Lord, obviously not afraid. He starts to walk on the water. But, then he looks away from Jesus and notices the wind and waves. He immediately becomes afraid and starts to sink. Then, he calls out to the Jesus to save him. And, of course, Jesus does. Jesus also tells him why he started to sink- he let his fear get in the way of his faith in the Lord. Instead of focusing on Jesus and trusting that Jesus was going to keep him safe, Peter focused on the circumstances and immediately did not trust in the Lord. This lack of faith is what caused him to sink. Peter’s lesson on fear is one we can learn from. Peter let the circumstances of his life get in the way of his relationship with the Lord. He let his fear overtake his faith. How many times do we do the same? How many times do we choose the easy way instead of the right way because we are afraid? Maybe we go hang with friends instead of going to Mass. Maybe we join in the gossip instead of standing up for the victim. Maybe we do something at a party we know is wrong. We do all these things because we are afraid of not fitting in; we are afraid of not being accepted. We are not focused on the Lord, but we are focused on our circumstances. Well, guess what? You don’t have to be afraid. You are accepted. You are worthy just for being born. God loves you more than we can ever understand. He wants you to have a life of happiness and joy. He wants to be part of your life and help you do great things. In order to do that, we have to choose to focus on him, and not our circumstances. Now, don’t worry, he knows you will make mistakes. Just like Peter doubted and began to sink, we will do the same. And when we cry out to the Lord, he will take our hand and keep us from drowning. So, you see, there is nothing to fear. God’s got this. He is inviting you on an adventure of a lifetime. All you have to do is look in his eyes and trust. Although life will not always be filled with sunshine and rainbows, life with the Lord will be a happy and joyful experience. Who knows, maybe you’ll walk on water someday. Here are the two choices we are working on for the 2013-14 High School Youth Ministry shirt. Which one do you like? Place your vote at the bottom. Thanks for all of your votes for the new fusion t-shirt. The winner is B! The shirts will be available for purchase for $15 at registration weekend (Aug 17-18) and our opening fusion night. Here is the new fusion shirt for the coming year. The shirt is maroon. Which colors do you like for the graphic? Place your vote below. 5 years ago, I was a middle school band director struggling with the purpose of life. I felt there was something more, something greater than the life I was leading. I went searching for the Lord who led me to a ministry I thought I was too broken to be a part of. I trusted. Now, here I am, 5 years later with a front row seat to the Holy Spirit in action. I have found more purpose and fulfillment in youth ministry than I ever thought possible. Is the Lord calling you to something greater? Trust him. Say yes. Take His hand and join Him on this great adventure. The mission trip with St. Francis ROCKED! Thanks for all your prayers and support. We are looking forward to next year!